the Chameleon 96-Fiber MTP Brand Cassette is built specifically for the Chameleon fiber/copper patching system. One 72-fiber or three 24-fiber MTP brand connectors (backbone) are plugged into the rear of the cassette. 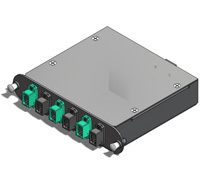 In the front of the cassette are six 12-fiber feed-thru MTP brand couplers for your patching. Inside the cassette is one unique 72-fiber harnesses with one 72-fiber MTP brand connector in the back breaking out to six 12-fiber MTP brand connectors in the front.